Spray tortilla with vegetable oil spray. Place tortilla on a Panini press or griddle. 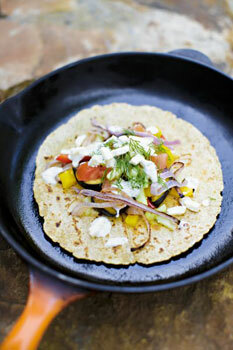 Place ½ cup roasted vegetable mixture in center of tortilla. Top with 2 Tbsp. diced tomato and ¼ cup cucumbers. Drizzle 1 Tbsp. tzatziki sauce over vegetables. Sprinkle 1 Tbsp. feta cheese over tzatziki sauce. Start rolling from one side and tuck in the bottom ½-inch. Keep rolling to form an open-ended cone. Arrange eggplant, yellow peppers, red peppers and onions in single layers on sheet pans. Brush with vinaigrette. Hold for 30 minutes. If excess liquid accumulates, drain and discard before cooking. Place marinated, drained vegetables in single layer on lightly oiled or parchment-lined oven-safe pan. Place in oven and cook for 10-20 minutes or until vegetables are just tender and lightly caramelized. Peel, seed and grate cucumbers (avoid over-grating). Stir in salt. Let stand for 15 minutes. Drain well. Stir in dill, garlic, pepper, lemon juice, mint, cumin and yogurt. Mix well.